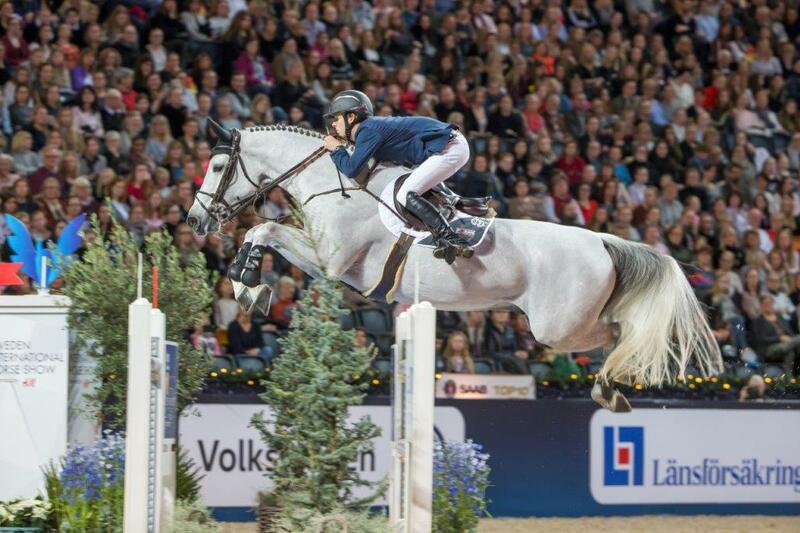 Bertram Allen, Ireland, with Gin Chin van het Lindenhof is the winner of Sweden Grand Prix presented by H&M, 1.55m jumping over two rounds, in Stockholm, Sweden. – This is a fantastic show; I have won six cars in total the past two years, and now the seventh. My horse jumped amazing today, says Bertram Allen, who had some nervous minutes watching last to go Peder Fredricson. – I knew Peder could be really fast, so I tried to give it all, I really wanted to win today in front of this audience, this is a unique place to compete at, with its atmosphere! Bertram Allen says. The course was very tough and almost all fences were on maximum 1.55m. From the first round of 18 riders, only the best five went in to the second run. These five were Nicola Philippaerts (BEL), Malin Baryard Johnsson (SWE), Irma Karlsson (SWE), Bertram Allen (IRL) and Peder Fredricson (SWE) – all clear in the first round. Philippaerts was first out but ended up at one down, 4 faults. Baryard Johnsson on lovely H&M Indiana was second out with a clear and solid round, not so fast though, with a time of 54,50 s, but second place. Irma Karlsson and Ida van de Bisschop did super fast turns and cut a lot of time, but unfortunately one down and time 44,23 s. Second last out was speed champion Bertram Allen on Gin Chin van het Lindenhof. Super fast round and clear with the time 42,63 s, the horse almost didn’t land before he turned for the next fence, and up in the lead. Last out in this final was Peder Fredricson and H&M All In, a couple we know can be really fast, but one down this time, but with the fastest time 42,16 s and a third place. – I’m very happy with my third place! There is a lot of prize money and a car in this class, but first of all you want to give the audience a great show. All along the line there has been a fantastic atmosphere during the competitions here in Stockholm. H&M Indiana is only 9-years-old and she did her debut in Grand Prix only two weeks ago with a double clear round, so her start in the highest classes has been very good. – She is not so fast, yet, but I knew I could be clear with her. She is a fantastic horse, half sibling with H&M All In, she has a lot of capacity, says Malin Baryard Johnsson, who also is a proud sports director of Sweden International Horse Show. – I’m very proud over the show; it’s not common to see this type of top class riding in all the classes. Course designer Peter Lundström has also done an amazing job with the courses, she says.